Sometimes when markets do virtually the same thing for two days in a row it gives us valuable clues about what they’re likely to do next. Today was not one of those occassions. So tonight we had an opportunity to repeat what we said yesterday about what markets revealed to us. In a word: nothing. Read the same message in a shiny new wrapper in The Deviant Standard for July 17, 2010 (PDF). The market did very little today. Consequently, The Deviant Standard for June 16, 2010 (PDF) has very little to say. But it’s here. Today’s persistent strength has forces us to give more weight to the possibility of an upward retrace that reaches much higher than where we are today. We had always considered this possibility, but had not given it much weight until today. Evidence suggest that we’ll see at least a small down move soon, and the development of that move may help us to discern more about the retrace. Read the details in today’s issue of TheDeviantStandard(PDF). Taking out 10,314 caused some problems with the count, but it’s not as if we weren’t anticipating the possibility. We lay several possible scenarios from here and establish the guideposts we’ll use to assess which one develops in the medium-term in the latest issue of The Deviant Standard (PDF). 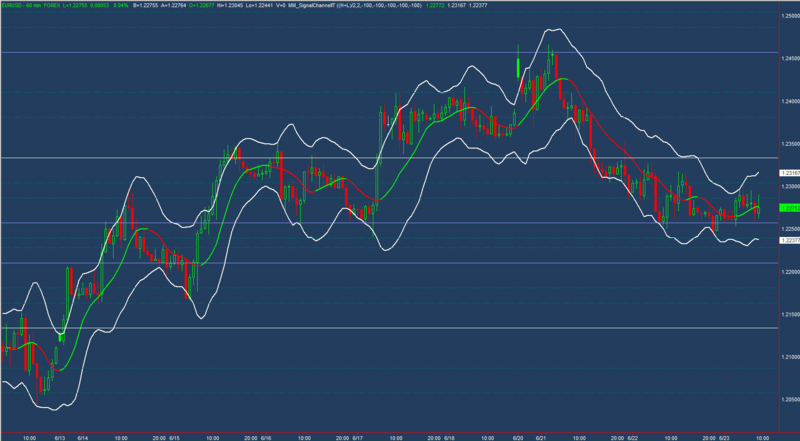 Whatever those moves are, we still expect the broader move to be down. 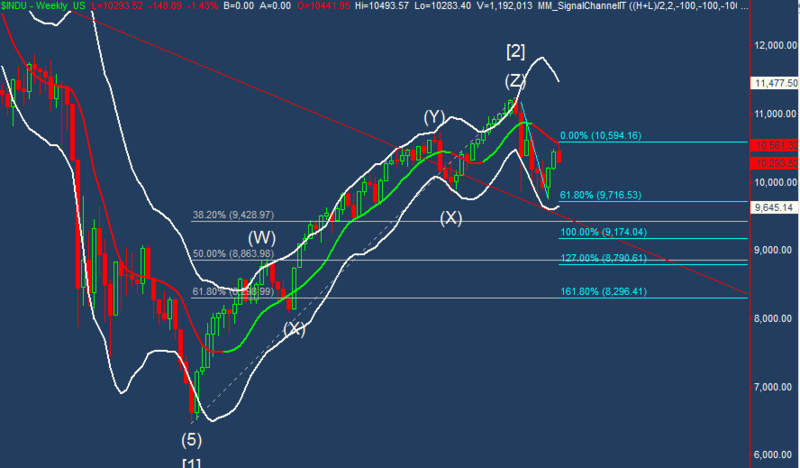 Having taken out the swing highs that we previously identified as wave 2, we are now in a position to revise our count. Look for ideas in tonight’s update. For the moment, nothing alters our overall bearish view. To do that, we’d need to identify a larger degree upward impulsive move. 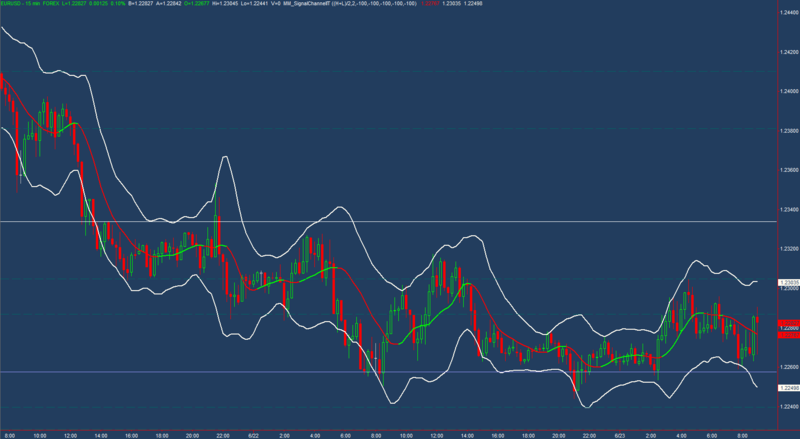 The most obvious way to count a possible larger five up is shown in green on our 10 minute chart. 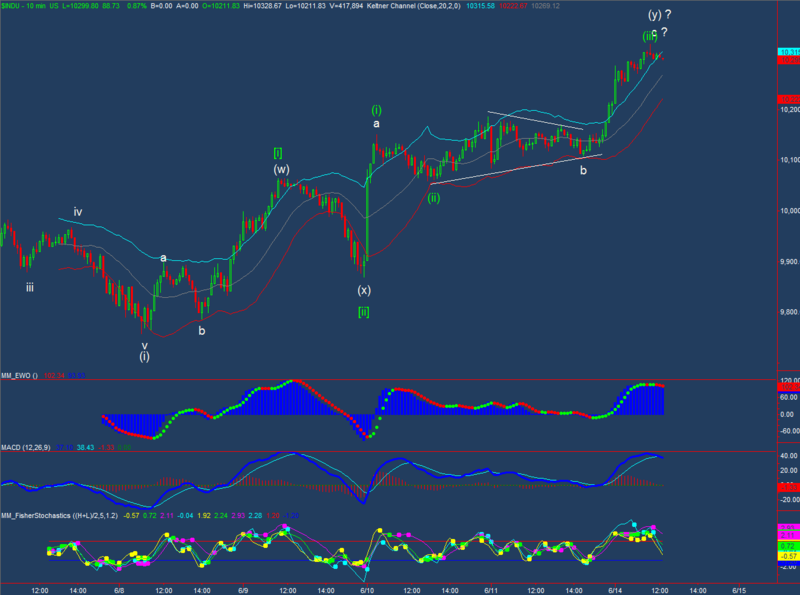 For the time being, it shows divergences on both the Elliott Wave Oscillator and MACD at today’s intraday highs. A good impulsive move up should give us higher highs on these indicators. So a bullish view would require green [iii] to continue extending upward to new highs and put in new highs on our technical indicators. We need to watch these indicators closely, because there nothing that prevents prices from heading up and doing just that. A break below Dow 10,150 would help rule out this poissibility, but wouldn’t prevent higher prices from a more complex correction than we currently have counted. At the moment, no down move is confirmed; just possible.